Whether you are a fan of the team or not we are all suffering a bit from Patriots hangover (sleep deprivation—not alcohol induced) after the Patriots’ win last night. (A survey suggests that over 17 million employees will call out sick today. Wow! I don’t get that. Now, tomorrow, the day of the victory parade in Boston when the temperature could be 60 degrees, I can see work in greater Boston coming to a standstill). Some critics complain it was a boring game. Some criticize Brady for a sub-par performance. Others simply despise the Patriots perennial appearance at the big game. Finally others are just jealous that Brady and Edelman are so good looking (that came from my daughters). Whatever the reason or wherever your allegiance lies there are HR lessons we can all gain from the Patriots’ winning ways. These can translate to just about every workplace and regardless of type, size and past performance (plus these don’t require physical agility or special diets). There is no substitute for hard work: While game performance is critical, conditioning that goes back to training camp, and even before, is what helps teams compete and succeed at the highest levels. Training employees is not just an onboarding exercise: it must be a regular occurrence with focus on what is required for each job, how one job related to another, observing performance difficulties and making adjustments as needed and preparations for what’s next. HR’s investment in training will always pay dividends. A team doesn’t need to be composed of all-stars to win: Tom Brady was picked 199th an in the 6th round of the NFL draft. He was the 4th string quarterback as a rookie. Beyond Brady and a few other noteworthy players ( who were also often overlooked by other teams) many of the Patriots players from year to year are not marquee names. One or two players don’t win big games. Likewise, one or two high flying employees can’t be expected to carry the ball for your organization. Good performers are of course important to all organizations, but that performance expectation should apply to all employees. Further, there is no harm, and there is often a benefit, to taking a chance on an applicant or employee who other employers might have passed over. Examples of this include : the older worker who is looking for a new challenge or a change of pace; the applicant with a criminal record who has since cleaned up his/her act; the person who had a workers compensation claim but is now able and ready to perform the job; a parent returning to the workforce after taking time off with her/his family; or a person with physical or mental challenges who is qualified to perform the job with or without a reasonable accommodation. A shared vision is required/ Buy in from top to bottom can’t be over-estimated: A boat can’t move forward if people row in different directions. In order to successfully complete a play or game plan players need to understand and follow the play/game plan. Of equal important is that every member of the team understand, buy in and act in accord with the team vision. In order for that to happen the vision must be well thought out , communicated and reinforced. The Patriots have always had one vision. That is communicated form the top from day one and all are held accountable. While this may seem like a top down and dictatorial approach, it isn’t: the vision is formed considering the composition of the team, the nature of the game, the opposition and the path for success. Belichick is held to the same standard and he therefore doesn’t tolerate noncompliance. Talented players who don’t buy in are traded, waived or encouraged to test the waters of free agency with other teams. Good coaching is vital: Bill Belichick is considered to be a genius (and he is) but he surrounds himself with a talented coaching staff. Each has his own responsibilities and each evaluate talent, help prepare players to do their respective jobs, make adjustments as needed and are accountable for the success of failures of their squads. Coaches can also be players. Senior and more experienced players on the Patriots help younger players develop and succeed. For an organization to succeed from year to year it need effective coaching from the C-Suite to cubicles or the factory floor. Effective coaching involves understanding each position’s responsibilities and how those are related to others. It also involves assessing each team member’s strengths, weaknesses and potential with a plan forward for the team member to hopefully grow in the position. Next man up is critical to sustain success: Players ( with the exception of Tom Brady) don’t last forever. There is a point when the player is no longer effective, he is injured, chooses to go elsewhere or retires. Successful teams don’t rely on one player. While some would argue that the Patriots have relied on Brady, the team has always had back-ups for him as well as every other player on that team. In fact, there often aren’t just one back up for most positions. In many instances players are cross-trained to step into another position when needed. In the workplace employers must be prepared for succession or substitution in order to stay competitive. This involves strategic planning and hiring. But it also involves flexibility and the ability to slot employees in to new roles if needed. Perseverance after disappointment: In football, politics, business and life, loss is inevitable. Every winning team has experienced disappointment ( e.g. two loses to the NY Giants and that stinging loss to the Eagles) but the key to success is not dwelling on past failures. Instead, it is understanding what went wrong , making changes and preparing for the challenges ahead. In years past the Patriots have prevailed even after injuries to key players. This year the Patriots suffered devastating and unexpected losses to teams everyone expected them to beat. In response, the regrouped and focused on the next game. Every organization has unexpected losses and other disappointments. Truly successful organizations learn from those experiences and move on. A little luck is a good thing but it can’t be counted on: The Patriots have had their share of good luck over the years ( resist the temptation to think it was based on spying, deflated footballs and biased officials) including amazing throws, receptions, kicks or game saving interceptions, fumbles or tackles. However, their success isn’t built on those events. That is because they have been the victim of bad luck too. Again, organizations that are successful, hire smart, train their employees, persevere when there are setbacks and stick to a solid game plan instead of hoping for a favorable bounce of the ball. Leading by example and giving credit to those in the trenches will help you stay healthy: Without a solid offensive line in front of him and consistently protecting him Tom Brady and the Patriots wouldn’t have been nearly as successful over the years. These players ( I dare you to name more than 5 Patriots offensive linemen from the last 18 years) are critical to the team’s success but they are often overlooked by the media and the fans. Brady has been wise to thank those players and even share the limelight as well as financial rewards and gifts to those players. Likewise, CEOs, managers and supervisors need to acknowledge the efforts of all employees, especially those who are critical to the organization’s success but don’t receive the attention like other high profile employees. The acknowledgement can come in many forms but public statements at meetings, employee of the month awards, bonuses and other recognitions help to keep employees engaged . Never assume yesterday’s success will guarantee anything going forward: The Patriots have been in 11 Super Bowls ( 9 during the Brady/Belichick era) and have now won 6 of those championships but preparation is already underway for next season as the slate is now clean and all teams are in competition for the next championship. While past success in business is often because of the elements mentioned above, and that can be a foundation for the future, successful teams and organizations never rest on their laurels. The Patriots have lost critical players to free agency , trades and retirement yet they have continued to succeed. They will likely lose more players in this off season. Planning for the future and always looking forward are proven elements of success for teams and organizations of all types. Focus and determination, certainly help in the 4th quarter of a game, but that must be insisted on from the outset: Physical conditioning help players perform at high levels but mental focus and determination to stay on task are what separates talented players from successful teammates. That focus starts when the player joins the team. The Patriots insist on that in training camp and they test that in practice each week. Commentators and coaches talk about mental toughness as a key ingredient to success. That is a Patriots’ trademark from the front office to the head coach to a starting player to a member of the practice squad. So while Brady is known for his amazing 4th quarter scoring drives none of that would matter if the team as a whole didn’t have the right focus throughout the season. Focus in the workplace is also not a last minute thing. It involves clear communication, commitment and consistent effort throughout the year. Whether that focus involves the design or manufacture of something, the development of a sales campaign or the accuracy of daily timesheets the ability for all in the organization to focus on their respective duties should determine whether the organization is successful or not. Bonus: Having a little chip on your shoulder doesn’t hurt: Motivation isn’t always rooted in financial gain. Having something to prove often helps an individual player and a team work harder. Early in this dynasty, the Patriots, who had been largely unsuccessful throughout the team’s history, were decided underdogs. 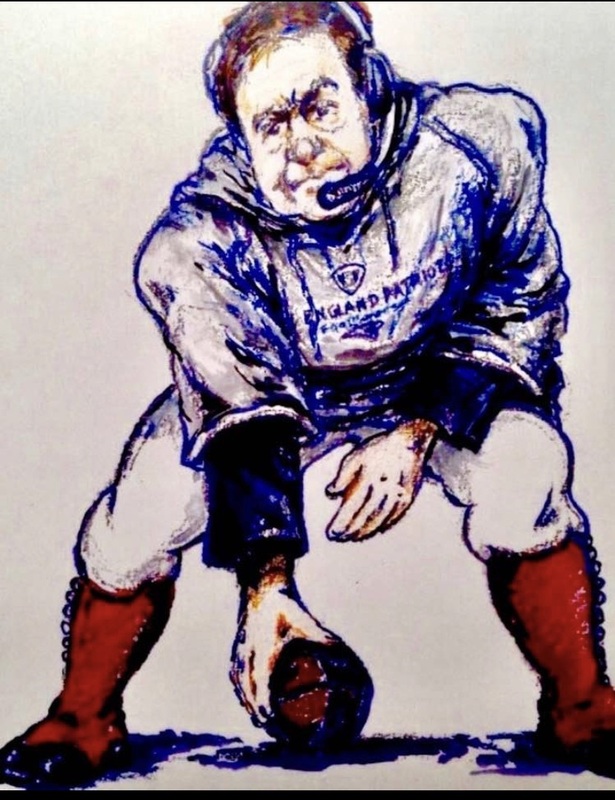 Belichick, long before he was considered the Emperor from the Evil Empire from Star Wars, was the Rodney Dangerfield of the NFL reminding the media and his players that the Patriots’ “ get no respect”. When the Patriots started to accumulate Lombardi trophies many would scoff at that notion wondering how the Patriots could claim second class status but Belichick still posted bulletin board reports from the media and other teams to help motivate his players to prove the critics wrong. For the last few years many have claimed that Brady was getting too old and he was too slow to compete at a high level. Critics said the Patriots reign was finally over this year and the team would now be relegated to former champion, now average team status. That ended up motivating this team to aim higher and achieve that 6th championship ring. The chip on the shoulder of an applicant can be to show she can perform the job regardless of what school she attended. It can also be so an employee can outperform expectations from a critical job evaluation. For an organization achieve its mission when others thought it impossible or outshine competitors in a tough marketplace. Encouraging employees and organizations to reach higher and go beyond what others think they can do ( and reward that achievement afterwards) can also help one achieve success. Oh, and finally, calling Tom Brady “ The Goat” (Greatest of all time) is intended to honor his achievements. Calling an employee a goat usually doesn’t have the same meaning and is therefore not recommended. Attorney Jim Reidy is the Chair of the Labor and Employment group at Sheehan Phinney.